Bryen was a poet. A poet of signs, words and colour, his poetry remains indissociable from his work as a painter. This conjunction between writing, drawing, print making and painting enabled Bryen to deepen his dreamlike quest and to capture “the outpouring radiating from unpredictable living reality”. A constant discoverer, his continual search for a different world encouraged him to pursue every type of experience. The heir to Dada in his poetry, he found there a liberty necessary to his work, which reinforced his revolt against doctrines, beliefs and restrictive ideological theories. He attempted to fathom the secret meaning of words and expected drawing to set free his inner world, allowing his instinct and urges to express themselves, defining the unity of his work characterised by the notion of “abhumanism”, or, according to Bryen’s own definition, “the world without man… complete availability, the refusal to sanction the choice one has made, or has submitted to” (abhumanist talk, Jacques Audiberti, Camille Bryen, L’Ouvre-boîte, Gallimard, 1952). We will only discuss here the figure recognised as the ‘father of tachism’ who, in his own words, “came to painting through anti-painting”. The first automatic drawings (1934–1935) followed by the functioning objects (1935), which led to research into texture and the use of non-traditional processes — coloured wax and candles, smoke marks — led to his first tachist work, Cire et bougie (1935) exhibited at the Surindépendants in 1936. This was a decisive experience, which revealed the artist’s sensitivity, perceptible in the coloured passages, the half shades and a feeling of space which led him to the ‘picture’. Fumée already contained this unexpected fantasy dimension within a structure alternating rigour and soft lines. A key work, it makes Bryen one of the initiators of lyrical abstraction. In 1946, he had an exhibition in Basel, at the Galerie Suzanne Feigel, of his first tachist gouaches in the company of Arp. His Structures imaginaires were prefaced by Audiberti. The following year, Bryen’s drawings were shown at the Galerie du Luxembourg in Paris. In 1947, with Georges Mathieu, he created the ‘Non-Figuration Psychique’ movement. The two artists organised an exhibition at the Galerie du Luxembourg, which has become historic: L’Imaginaire, prefaced by Jean-José Marchand and in which Atlan, Hartung, Ubac and Riopelle also took part. Lyrical Abstraction was born. Bryen gave the following definition of his painting, which may be applied to lyrical abstraction in general: “Painting is the expression of life’s deepest manifestations and is organised as a cosmic function. Far from being restricted to sensory emotion, it acts likes magic approaching the clairvoyance not only of the eye, but also para-optical clairvoyance: not only the dimension of forms and colours, but that of absences, doubles, memories, psychic and physical ambivalences. Man is never alone before his painting; there is a splitting in two of his being… Painting is played out far from human values. Luxurious, and apparently useless, like a real natural phenomenon, it transposes the disoriented person into a new vacuum cleaner for exploring and living” (Bryenjepeinsje, La Tour de Feu no. 51, 1956). The movement’s second exhibition took place in 1948, at the Galerie Colette Allendy: HWPSMTB (Hartung, Wols, Picabia, Stahly, Mathieu, Tapies, Bryen). Bryen made his first prints. In 1949, he had an exhibition at the Galerie des Deux-Isles prefaced by Audiberti, Camille Bryen poileur de pierres, which included his first oil paintings. The following year the gallery showed his prints, and the series of drawings Cuivres et Plumes. In 1950 Bryen had an exhibition at the Galerie Pierre, on which occasion he gave a talk. He had an increasing number of solo and group exhibitions. Room does not allow to list all of them here, but some should be mentioned because they show Bryen’s importance within the Art Informel movement. In 1951 there was a first exhibition of non-figurative painters at the Galerie Nina Dausset, at which Bryen met Mathieu, Hartung, Pollock, Riopelle, Russell, Capogrossi, de Kooning and Wols. This exhibition was titled Véhémences confrontées, presented by Michel Tapié. The following year the critic showed Les Signifiants de l’informel at the Studio Facchetti. Bryen also participated in Charles Estienne’s Salon d’Octobre in 1953; in the group exhibition Phases de l’Art contemporain at the Studio Facchetti in 1954; and in Individualités d’aujourd’hui at the Galerie Rive Droite. In 1955 Michel Tapié showed Tendances nouvelles at the Kunsthalle in Bern and Colette Allendy showed Wols and Bryen in an exhibition titled 2bis. The web-like watercolours that he exhibited in Geneva (1952), Lausanne (1953), Stuttgart (1953), Paris at the bookshop Les Amis des Livres (1953) and London (1956) have coloured stains that contrast strong and weak areas among an interweaving of strong oblique lines. This structure is repeated in his paintings which, from 1956, adopt a chess board construction: Précambryen is a key work in this respect. Transparent shades and delicate Indian ink join to strengthen a sensation of fluidity and infinite space. Bryen continued exhibiting in France and abroad. In Paris in 1956 at the Galerie Stadler. In 1957 in Milan at the Galleria Apollinaire (with a preface by Jean-Pierre Restany, Bryen, délirant, aventurier de l’inconnu). In 1958 in Vienna (40 drawings from 1934 to 1958). In 1956 he participated in a group exhibition at the Galerie Kléber, Phases. In 1959 his first retrospective was held, titled Cent œuvres choisies, with a preface by Julien Lanoe, at the Musée des Beaux-Arts, Nantes; Lausanne (preface by Pierre Restany, Camille Bryen, poète du dessin), Milan (preface by Pierre Restany, L’espace dans l’homme) and a distinction for the Prix Lissone. In 1959 Bryen painted Feu de bengali, a new phase in the expression of his sensitivity, showing greater sensuality and calm. Paysage intérieur is a series in which the yellow, orange, ochre and white checks become larger while the graphic violence diminishes. In 1960 Bryen had an exhibition of recent paintings at the Galerie Cazenave to coincide with the publication of R.V. Gindertaël’s book Bryen. He participated in a group exhibition titled Antagonismes at the Pavillon de Marsan, Musée des Arts Décoratifs, in Paris. In 1961 the Galerie R. Cazenave, showed 24 drawings. Bryen’s works became increasingly ethereal. He was frequently present at major events: in 1960, for the Solomon Guggenheim Prize in New York and the Venice Biennial. In 1961, he was outside the competition for the Prix Lissone, Sao Paulo Biennial. In 1962, he participated in the Marzotto Prize in Rome; illustrated Vigies by Tristan Tzara. In 1962 he participated in a travelling exhibition titled l’École de Paris at the Tate Gallery in London then shown in Cardiff, Liverpool and Aberdeen. 1963 exhibitions École de Paris in Zagreb and Ljubljana. 1964 Galerie La Hune, Vingt œuvres graphiques; L’Atelier de Bryen, Galerie Argos, Nantes; Galerie Daniel Cordier, Paris. 1964 Cinquante ans de collage, Musée de Saint-Etienne, subsequently shown at the Pavillon de Marsan. In 1965 there was a presentation at La Hune of the audio-visual book Carte blanche à Bryen with a record and ‘Bryscopies’, original slides. 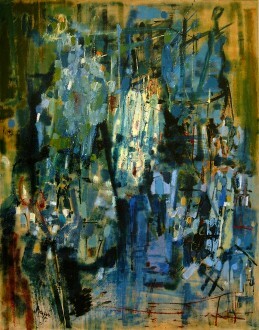 1965 Thirty-five contemporary painters in Japan, Tokyo; École de Paris in Prague, Bucharest and Budapest. Bryen exhibited at the Salon des Réalités Nouvelles in 1946, 1947, 1948 and 1956. Salon de Mai 1956. Member of the Salon d’Automne in 1963. An essential figure of the movement designated by Michel Tapié by the name ‘Informel’, this critic naturally included Bryen in his book Un Art autre, subtitled Où il s’agit de nouveaux dévidages du réel (1952). Two works reproduced: Hépérile (1953) and Tellurie, illustrating Bryen’s remarks in response to Jean Grenier, who had asked him to give a definition of ‘Informel’: “My research tends to bring the unconditional to life: I have wanted to dissolve form… I could only combat form by creating non-forms. I then noticed that form reappeared… I obtained what I called non-non-forms… It was an attempt at non-figurative mysticism” (Interviews by Jean Grenier of Dix-sept peintres non figuratifs. Calmann-Lévy (1963). 1970 Rétrospective, Musée des Beaux-Arts du Havre, preface by Geneviève Testanière. 1970 Bryen, œuvres 1965–1970. Galerie de Seine, Paris. Catalogue. 1971–1972 Travelling exhibition organised by the CNAC. Catalogue by Daniel Abadie. 1973 Rétrospective, Musée National d’Art Moderne, Paris. Catalogue, with texts by Jean Leymarie, Jean-Hubert Martin and Marielle Tabart. 1979 and 1981 Musée National d’Art Moderne. Centre Georges Pompidou, Paris. (Donation Bryen). 1988 Œuvres graphiques 1948–1960. Galerie Callu Mérite, Paris. Catalogue by Jacqueline Boutet-Loyer. 1990 Bryen, huiles, gouaches, plumes. Galerie Callu Mérite, Paris. Catalogue by Jacqueline Boutet-Loyer. Daniel Abadie: Bryen Abhomme. La Connaissance, Brussels 1973. Jacqueline Boutet-Loyer: Acides Abhumaniques. Prints and lithographs. Nouvelles de l’Estampe 22, July-August, 1975. Jacqueline Boutet-Loyer: Bryen, l’œuvre peint, catalogue raisonné. Librairie Quatre Chemins. Editart. Paris, 1986.